Once upon a time there was an eye surgeon who decided to live his dreams. His particular dream was to practice medicine in underdeveloped countries and to sail around the world on a yacht. Such a radical dream meant he would never become rich or famous. Because this was such an important decision, the surgeon knew that he should spend a large amount of time looking into its pros and cons, and he should closely examine the impact it would have on his life. Therefore, he totally dedicated five thought-filled minutes to this decision. Those five liberating minutes were all he needed to start walking on the path to his dreams. The surgeon now knew where he was going, and what was he was going to do with his life. But there were still several important lessons he had to learn, and those lessons focused on security, survival, and stuff. He learned that when you travel on the path to your dreams, there is no such thing as security. It just doesn’t exist, and it makes no sense to worship at the altar of security, because security is a false god. Life is inherently risky, and the bigger your dreams, the more risk you have to take to make them come true. He also learned that in the long run, we are all dead. Life has no survivors. Since you only get one life which is far too short, he decided that he should make his life into what he wanted it to be, and that it should count for something good. Finally, he learned that no matter how much stuff you accumulate on your journey through life, you can’t take any of it with you when you die. Therefore, he decided to not spend a lot of time and effort in piling up a mountain of money and other acquisitions that would slip instantly from his grasp at the moment of his death. Once he realized that there was no security, that there were no survivors, and that you can’t take it with you, he became a free man. He was liberated to live his dreams. Deciding to live my dreams was one of the smartest things I ever did. Hmm. Perhaps it wouldn’t be a bad idea for you to do the same. …… AND NEVER SURRENDER YOUR DREAMS. Take a look at the wind and waves. The wind is blowing forty knots and Duetto, Balmacara, and Exit Only are anchored at Ras Terma in Eritrea. There is a white out from blowing sand lifted high into the air by a sandstorm. But at least the anchors are down and holding, and we are no longer being hammered by the seas of the Bab Al Mandeb. Two days earlier, we left Yemen and sailed through the Gulf of Aden until we arrived at the Bab Al Mandeb which is the southern entrance to the Red Sea. The Bab has a ferocious reputation because the winds in that area frequently blow at fifty knots. Everyone sailing up the Red Sea must run the boisterous gauntlet as they sail through the Bab. When it was our turn to sail those treacherous waters, we experienced first hand why the the Bab al Mandeb is called the Gate of Sorrows. We pointed our bows north, pushed open the Gate, and before long, we running downwind in a fifty knot gale with turbulent steep seas crashing into our stern. We went through the Bab in the morning, and so we had plenty of daylight to work our way north at about eight to ten knots. We hoped that if we got far enough north, the winds would moderate, and the seas would lose their punch, and we would have a more enjoyable and less risky sail up the Red Sea. Unfortunately, the Bab showed us no mercy. The wind persisted at fifty knots all day long, and it was apparent that it was going to be a long night at sea if we didn’t find shelter. We wanted to continue north as fast as possible, but we also wanted to do it safely. We had talked on the radio with other people who had transited the Bab in similar conditions, and they reported strong winds for up to thirty six hours. That was bad news, and we didn’t want to take a beating for that long. Our other option was to head for Ras Terma, which was a deserted anchorage behind a high headland in Eritrea about fifteen miles away. We decided to go to Ras Terma and hopefully ride out the strong winds in a sheltered location. We tacked over on to a beam reach and headed for land. I turned off the autopilot and steered by hand. I was afraid that the wild seas might overpower the autopilot and strip its gears. Hand steering the yacht for half a day in rough conditions was inconvenient, but at least I would be sure to have an autopilot that was working when the weather moderated. We needed the autopilot to comfortably steer Exit Only for 1700 miles up the Red Sea. It took three hours of extremely wet sailing to arrive at Ras Terma. 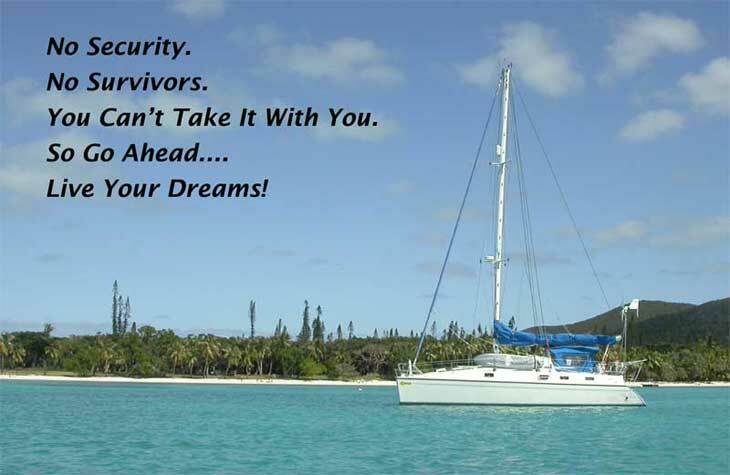 We were beam on to the steep seas, and the waves that struck the side of the yacht relentlessly dumped gallons of salt water over me as I steered at the unprotected helm. Each new wave deposited more salt into my clothes until my shirt and pants became stiff from the accumulation of salt. My clothes turned into a pillar of salt. Ras Terma proved to be a secure anchorage, but the winds still blew at thirty-five to forty knots for at least a day and a half before they abated. We hunkered down and waited for conditions to improve. 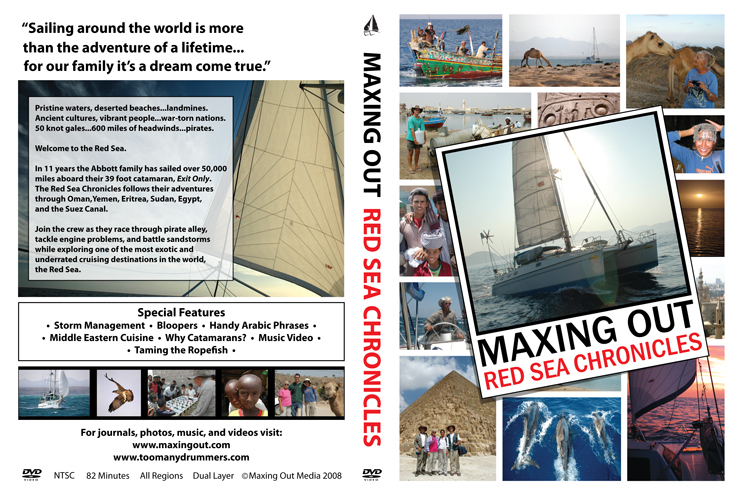 While we were anchored there, a sandstorm came through and covered our boat with red desert dust. We shut up the boat to keep sand from coming inside and creating a huge mess. At least we had survived the Bab without damage. Caked on salt spray mixed with desert dust is a small price to pay to escape from the clutches of the Bab Al Mandeb. Once again, Exit Only had proven that it was a strong and seaworthy vessel. It took a licking and kept on ticking. While it’s true that adversity had paid visit, it didn’t move in and become a permanent member of our crew. We are careful about such things. 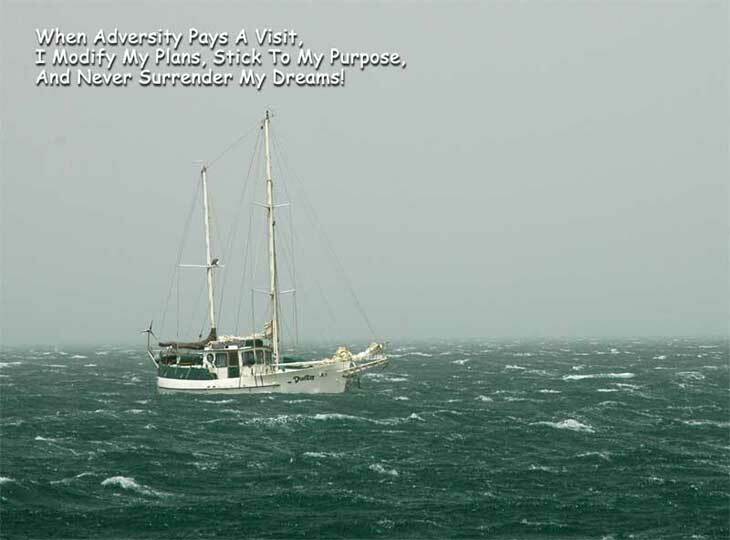 When adversity pays a visit, we modify our plans, stick to our purpose, and never surrender our dreams.